The rendering finally does most of what we want it to. It was about time frankly. We’ve added billboards to display unit status: step count and the rest. I was unhappy with the amount of zoom normally provided by other games using this Civ-like perspective. I think this is partly because scaling the billboards is hard, which we learned (duh) the hard way. Now that we can scale them though, we’ve been having a great time zooming in and out. It’s really awesome. We improved hex grid rendering: because our terrain is proper 3D, having the grid boogie up and down the mountains was highly unsatisfactory. The solution with dashes seems to be the way to go – it has held up in tests so far. There are quite a few new graphical assets and improvements, though mostly the last few months were still about exploring the technology. We did (insert large number) of tests to make sure that coastlines and river beds look good at all zoom levels. We played with roads and bridges, and while the technology is now settled, there is still much to learn about using it to make the game both look good and be readable. The units are still drowning in the terrain, which is fair play since this is kind of the point of military uniforms. Not really good for gameplay though. We tried incidence angle shading as a simple way to boost the units and make them stand out but the results were decidedly meh. We’ll probably try some sort of shadow/glow combination next, as eventually we have to find something to make them stand out more. Most of our time during the summer, fun stuff above notwithstanding, was a real grind involving fairly low-level stuff. We did finally create the full game state, the arrays and tables which make the game run under the hood. This is a relatively fun thing to do… if you’re into spreadsheets. This work builds on original Unity of Command, and that’s good news because it means we’ll be able to do things much faster now. A surprising amount of work went into data validation. If you didn’t know what this is: the game reads almost all of its data from what are essentially text files. Now, if Joe Modder goes and makes a bunch of changes to these files, this is something we generally approve of. It would be decidedly uncool however, if any small typo or a syntax error in one of these files would crash the game. For example, if Joe wanted to increase max steps to 9 and typed in “max_steps: NINER”, the game would not understand the intention (sorry Joe!) but it would cleanly report an error rather than crashing to desktop. Exposing your game data like this, and then painstakingly validating each value is, again, a surprising amount of work. I sure hope the mod support results in people coming up with cool mods, that would make it so worth it. Finally, the map, our old nemesis, accounted for a good share of our time once more. We added support for combined map assets to the editor. For example: a mountain is a heightmap, plus some decals, and there is a smattering of trees that go with it. While the trees are still handled separately (reasons! ), the rest handles like a single asset in the editor, which means you can move it, scale, rotate etc. We did a similar thing with farms, where we allow you to combine several of the small farms into larger patches and stamp those on the countryside, rather than working one by one which was super annoying. We added full command buffer stack support to both map and scenario editors (undo/redo), z-ordering of map decals, and proper elevation for soldiers positioned in a mountain hex. We also fixed about 3 million self-intersection issues related to coastline editing and this is now decidedly the most fun tool in the map editor to use. Thanks for the update! I enjoy reading them and I am looking forward to next year. Looking forward to being invited to the beta! 🙂 Everything sounds and looks great! Regarding beta testing: once we’re ready, we’ll make a call for testers on our mailing list and here on the blog. You should be safe following one or the other. Seem to be great, are the ground level lines showable (like on a tactical charts ) ? Guys, I’m soooo relieved that you’re still on it. Can’t wait to see it running on my computer. Soooo cool!!!! Yeah, about time to let us know and good progress to boot! Please upload the screenshot in HD so I can cancel my subscription to PornhubHD. Seriously keep up the good work guys. I played in the last betas and this is still one of those games I’ll still turn on once a month or so to replay a mission. Looking forward to seeing the playable state! Exiting stuff. This is what the HOI4 map should have looked like indeed. Wow, looks just wonderful and really looking forward to seeing more of the game. Please post some more of those lovely screenshots! Apart from TOAW4 this is my most-anticipated war game this year! The game is looking awesome. I continue to play UoC and cannot wait for this next installment. PS Perhaps go for a grey colour for the neutrals…. I would preorder this game if I could. Just found the blog. Loved first UoC. Here is a question. Will the AI be better at conducting counter offensives? 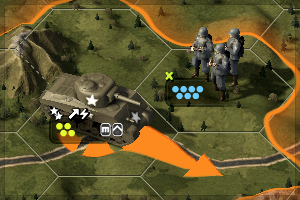 I would LOVE to see a battle of the bulge where the AI can destroy you if you make a mistake. Re: AI, we are definitely trying to make it attack better. 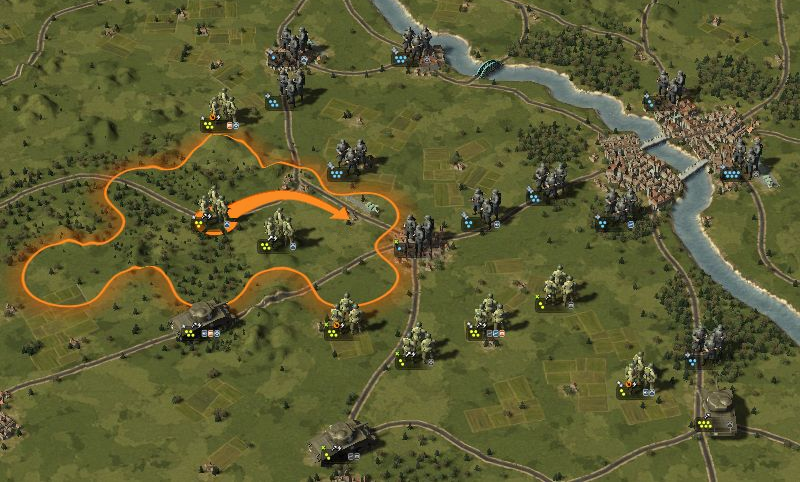 You could already see the AI do some limited-scale attacks, for example in Donbas Nip and Daniel’s Zitadelle scenario. How do we join the mailing list? In regards to the units drowning in the terrain, perhaps the ‘billboards’ could extend right across the bottom. This extension could be hex shaped to help your eye parse the map as the game board it really is. @aren: there’s a “Join our mailing list!” field at the bottom of our Home page. @Richard: not a bad idea, however the camera pitches when you zoom in/out… this means the hex-shape would actually change its shape slightly (in 2D) when zooming. Which means the layout of the billboard itself would be non-fixed.